Booked a 2 bedroom apartment. Roomy for three persons. Heating is still provided during the mid April, which is a nice and sweet touch! Amazing flat. We enjoyed every minute we were there. The location is good, small village with only a few neighbours. WiFi worked properly, the only thing is that the shower hose was totally broken, but we didn't want to disturb our hosts as we arrived really late and we supposed they were sleeping. The owner was ready for out late arrival. The large apartment was clean with a full kitchen comfortable bed and couch. Plenty of space in a quiet neighborhood in walking distance of the center. We had 2 clean and comfort rooms. Good location. 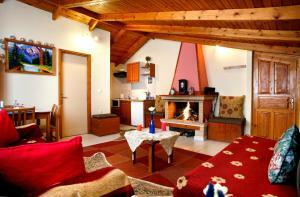 In my opinion Arochova is the better option for accommodation for those who visiting Delphi. Spacious, warm, clean, comfy and central location. The apartment was lovely as well as clean, cosy and warm with a beautiful view. Loved the breakfast we helped ourselves to from the fridge. Lovely fluffy duvet! Walking distance from the city center and we could park in front of the house. Breakfast was good and we appreciate that we could have it in our apartment. The apartment is like in the picture, nice and cosy, comfortable, clean. For one night, we had everything we needed. We recommand this apartment with all our hearts. 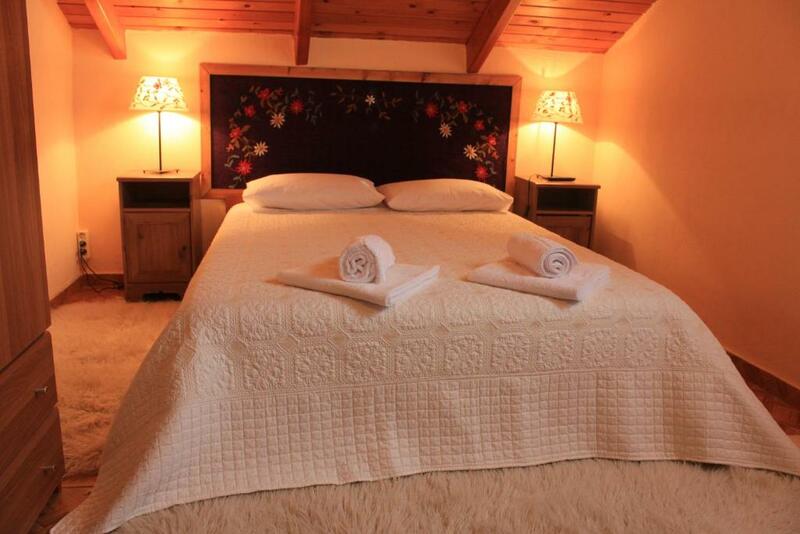 Lock in a great price for Patriko – rated 9.1 by recent guests! One of our best sellers in Arachova! 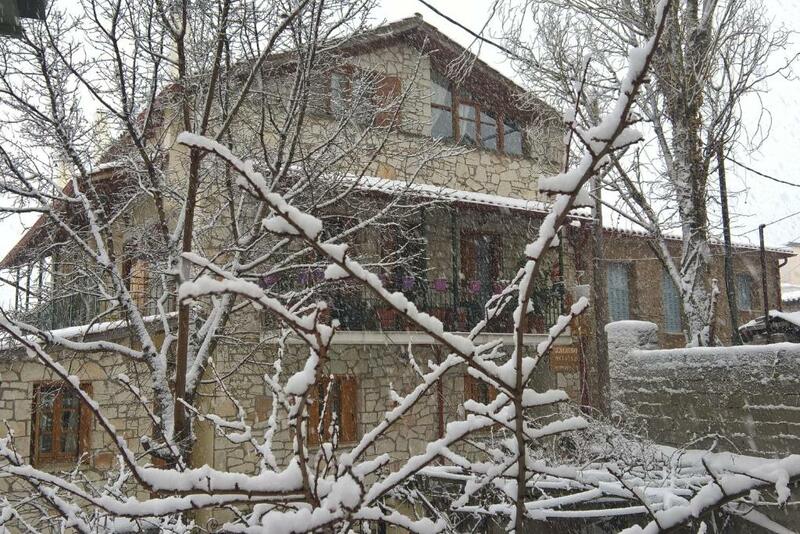 Centrally located in scenic Arachova, stone-built Patriko features spacious apartments with a fireplace, free log wood and mountain views or access to the garden. Guests are offered free Wi-Fi. Ski storage is available. Featuring inclined, wooden ceilings, traditional rugs and draped curtains, apartments include a sitting room with sofas, LCD TV and dining area. A 2nd TV is available in the separate bedroom. The kitchen is equipped with fridge, microwave and cooking hobs. Breakfast including marmalade, cake and fruit juice is served in the room. Traditional taverns and shops are within a 3-minute walk. Parnassus Ski Center is at 19 mi. The ancient site of Delphi is a 15-minute drive away. 뀐 Located in the top-rated area in Arachova, this property has an excellent location score of 9.1! When would you like to stay at Patriko? Features fireplace, wooden ceilings, traditional rugs and offers views of Mount Parnassus or access to the garden. Consists of bedroom with LCD TV and separate living room with kitchen, dining area and sitting area with sofas and a 2nd TV. A microwave oven, cooking hobs and fridge are available. Some are located on the ground floor. 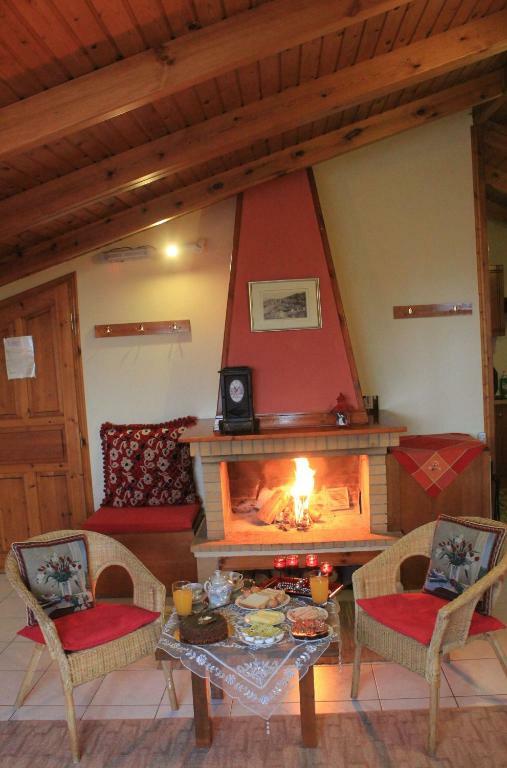 Offering mountain views, this apartment is fitted with a fireplace, traditional rugs and wood beamed ceilings. It includes a separate bedroom, seating area, kitchenette, 2 TVs and free Wi-Fi. 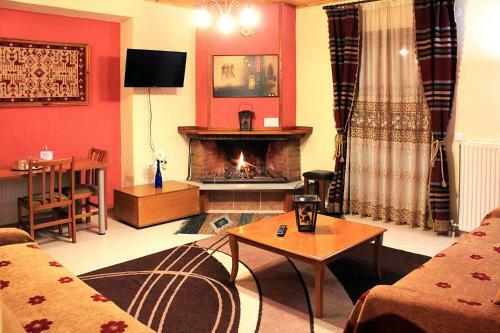 This apartment feature 2 bedrooms and a seating area with a fireplace. It enjoys 3 TVs and a well-equipped kitchenette with cooking hobs, fridge and coffee maker. Το χιονοδρομικό κέντρο Παρνασσού είναι ίσως τα καλύτερα οργανωμένο και εξοπλισμένο της χώρας και καλύπτουν τις ανάγκες για αρχάριους και προχωρημένους λάτρεις του σκι, ακροβατικό σκι αλλά και με πολλές δυνατότητες για ενδιαφέρουσες καταβάσεις εκτός πίστας. Είναι επίσης μια ιδανική αφετηρία για διασχίσεις με ορειβατικά σκι. Βρίσκεται σε υψόμετρο 1.600μ – 2.300μ., διαθέτουν 13 αναβατήρες με 20 πίστες συνολικού μήκους 14 χιλιομέτρων. Οι 16 είναι πίστες κατάβασης μήκους από 600μ. μέχρι 4 χλμ Από αυτές οι 13 είναι μπλε (για αρχάριους, μέσους και καλούς σκιέρ), ενώ οι τρεις είναι μαύρες αγωνιστικές. Η περιοχή προσφέρεται και για πεζοπορία μέσα στο ελατόδασος του Παρνασσού, ορειβασία και πεζοπορία. Αράχωβα – Μάνα- Μπαϊντάνης: Μια πανέμορφη διαδρομή τόσο για πεζοπορία όσο και για ορειβασία. Το φυσικό περιβάλλον της περιοχής προσφέρεται και για εναλλακτικό τουρισμό όπως trekking και ποδήλατο βουνού σε ορεινούς δασικούς δρόμους και μονοπάτια αλλά και αναρρίχηση-καταρρίχηση σε βράχους και αναρριχητικά πεδία με τη βοήθεια έμπειρων οδηγών βουνού. Για τους πιο απαιτητικούς και ριψοκίνδυνους η περιοχή προσφέρεται και για RAPPEL που αφορά κατάβαση απότομων βράχων. Η μοναδικότητα των χιονοδρομικών μας με τις 2 θάλασσες στους πρόποδες του Παρνασσού κάνουν την εμπειρία του σκι, απίστευτη. Αγναντέψτε την θάλασσα κάνοντας σκι ή απλά πίνοντας τον καφέ σας σε υψόμετρο πάνω από 2000 μέτρα. Αναρίθμητες ποδηλατικές διαδρομές για όλα τα επίπεδα και όλους τους τύπους ποδηλάτων. Mountain bikes, downhill και κούρσα, κάνουν αυτόν το τόπο ιδανική επιλογή για τους λάτρεις του αθλήματος. Μονοπάτια, δασικοί δρόμοι, απόκρυμνοι βράχοι και μοναδικά τοπία, συνθέτουν τον χάρτη για πεζοπορεία στην περιοχή μας. Ιδανικές διαδρομές για όλα τα επίπεδα. Μοναδική αρχιτεκτονική, εξαιρετικά τοπία, γραφικά στενά, το παραδοσιακό και το συγχρονο συνυπάρχουν όλα μαζί… μόνο στην Αράχωβα. ΔΕΛΦΟΙ Το κέντρο του αρχαίου κόσμου, η μοναδική ιστορία του πολιτισμού μας… μολις 8 λεπτά από την Αράχωβα. ΟΣΙΟΣ ΛΟΥΚΑΣ Αρχιτεκτονική τελειότητα σε ένα μοναστήρι βυζαντινού ρυθμού από τον 9ο αιώνα μ.χ., μόλις 20 λεπτά από την Αράχωβα. House Rules Patriko takes special requests – add in the next step! Patriko accepts these cards and reserves the right to temporarily hold an amount prior to arrival. Please note that firewood is offered free of charge. Please inform Patriko of your expected arrival time in advance. You can use the Special Requests box when booking, or contact the property directly using the contact details in your confirmation. I was surprised that we had to boil the eggs on portable gas devise for breakfast by our self: is it the meaning of 'including breakfast' ? and on of the gas tanks was empty.... In addition, the parking near the property is not feet to a van. Rooms did have too much wood smoke smell and we didn't use the fire. It would have been useful to have a kitchen towel and a few more more cooking utensils like a wooden spoon and spatula. No easy parking but owner very friendly and was able to accommodate us very quickly. Breakfast : we paid for breakfast included but in fact it was self catering. They only provided with some industrial ingredients to cook by ourselves in the kitchenette inside our room with very poor facilities (old toaster, very old stove, etc) Finally we had our breakfast in a café in the town paying extra... It’s really a shame to be paid for a room charge with « breakfast included »!!! Decoration is a little outdated and there was no shampoo/shower gel. 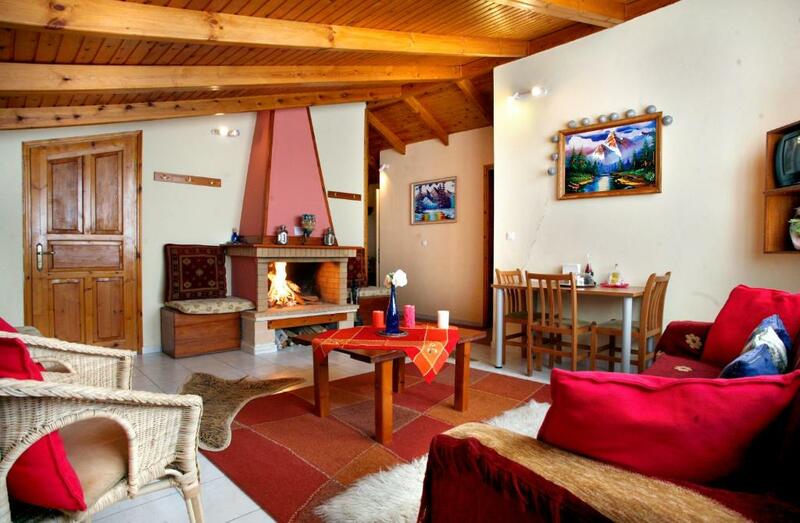 Great appartement in the mountains! 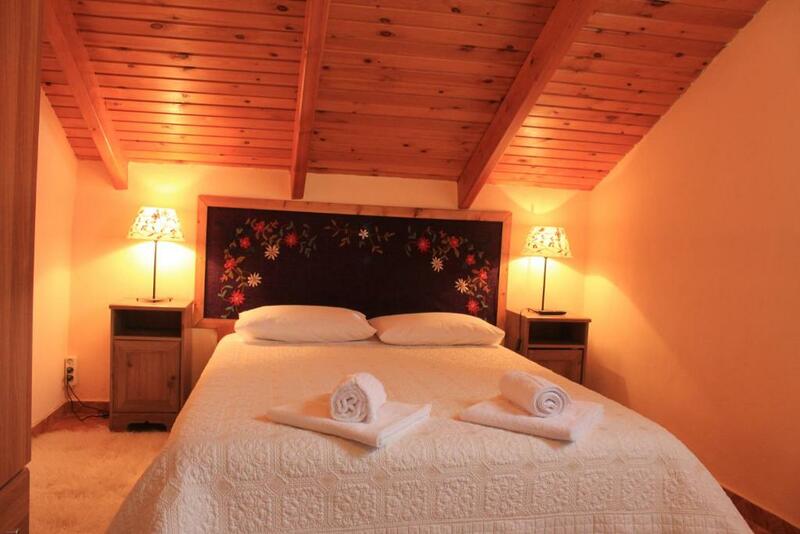 Quiet and cosy location, very well equipped kitchen, the bathroom as well, rustic atmosphere, cleanliness. In a walk distance to tavernas, local products shops and the relaxing coffee-bars area in the Main Square of Arachova. Nothing scary parking in front of the property, plenty of space... Suitable for those who travel by own car to visit the Archaeological site and the Museum of Delphi. Not the properties fault but one very noisy neighbour at midnight wasn’t appreciated. 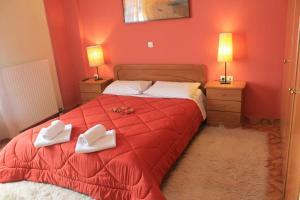 The room was very comfortable with great facilities and very clean.